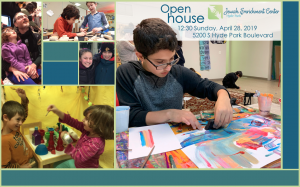 We have created something groundbreaking: a model of Sunday and after-school Jewish education where children become co-creators of a compassionate, meaningful, authentic, and personal Judaism. Far from struggling to find meaning in a static Jewish tradition, our children celebrate and confidently shape their Jewish beliefs, values, and practices. Our children don’t struggle to reconcile their personal experiences and moral intuitions with a religion defined and interpreted for them by professional Jewish teachers or leaders. Rather, children study, interpret, and bring Jewish texts to life for themselves, in a community that practices careful listening, critical and creative thinking, and expects dignity for people of all ages. Our children grow up to demand and create institutions that practice these values throughout their lives. They know that Judaism is a resilient and vital part of who they are and how they see– and change– the world. This big shift is the result of three foundational beliefs, realized through our innovative curriculum and educational practices. Children: We believe children of all ages are immensely capable and deserving of dignity. We trust them to grapple with ambiguity and complexity, within themselves, their communities, and Jewish texts and traditions. We know that with support, children can understand and voice their own needs, and naturally want to take care of themselves and one another. We encourage them to ask profound and important questions, and discover answers to their own questions. Judaism: We believe that Judaism is a dynamic, ever-growing, ancient and ongoing conversation. This Judaism is resilient, rooted in history, and relevant, and it is continually being shaped by the ideas and voices of people of all ages, all across the world. Our children’s Jewish ideas and creativity can guide and inspire that of their families and communities. By helping children discover the language and structure of Jewish texts and traditions, and practice respectful and thoughtful dialogue about their ideas and interpretations, we empower them to participate confidently in the ancient and ongoing Jewish conversation. Teaching and Learning: We believe that if children are to become confident and joyful co-creators of Judaism, they must be able to engage in this work now, not wait until they are adults, by exploring and interpreting Jewish texts in a context that encourages their curiosity, and affirms their creativity, capabilities, and lived experiences. Accordingly, every element of our curriculum and educational process is designed to reflect that goal. Nothing in our program comes out of a box or a template: our commitments are expressed in everything from the design of our handmade Hebrew games, to the layout of our classrooms, to the translations of texts we create for each age group, to the words we use to encourage community values as we pass out snack. We use language that fosters curiosity and affirms children’s experiences, beliefs, and ideas. Our curriculum is designed in collaboration with the children, following their interests and questions, and our project process encourages children to explore, express, and share their ideas with the wider community. Finally, our education team continually reflects on, experiments with, and revises our educational practices, as we learn more about how to help children learn and grow.